U.S. support for the Syrian opposition seems likely to decrease drastically when President-elect Trump takes office if he follows through on his promise to focus attention on fighting Islamic State (ISIS, or IS). The Trump administration will take power at a time when the U.S. policy in Syria is a due for a change. America’s main goals in Syria have been to move Bashar al-Assad from power and completely eliminate ISIS and other jihadists from Syria. Neither aim is presently achievable. The United States should continue to limit its direct involvement and exposure in the conflict, although it can take action on the margins to achieve specific U.S. aims. The fight against ISIS should not come at the expense of other U.S. interests. Trump should avoid entanglement with the Assad regime, only giving up U.S. support for the opposition in exchange for a soft landing for America’s opposition allies and their civilian constituents. The United States should prioritize civilian relief and protection, and urge Syria’s neighbors to do the same. U.S. Syria policy had been due for a major rethink, even before Donald Trump was elected president. America’s publicly articulated goals in Syria—including effecting a negotiated political transition away from Syrian President Bashar al-Assad and totally defeating the self-proclaimed Islamic State and other jihadists now inside Syria—have been obviously impossible for some time now, at least in their most optimistic formulation and using any realistic means. Continuing U.S. involvement in Syria and support for the Syrian opposition mostly would have made sense in more cynical terms. America could not proxy-war its way to an inclusive, stable end-state in Syria, but it could bloody the Assad regime and its allies, Russia and Iran, and frustrate their brutal campaign to retake Syria. If, as now seems likely, President-elect Trump is going to prioritize more cooperative relations with Russia and even coordinate to fight jihadists in Syria, that strategy no longer seems operative. But even as the United States reevaluates its Syria posture and potentially disengages from the Syrian opposition, it must be careful not to overcorrect. The Syrian opposition is a problematic partner, but the United States should not turn instead to the Assad regime. Allowing the United States to be enlisted in Assad’s war would gravely damage America’s international standing and, in practice, promise little operational benefit. The idea is to extricate America from the Syrian war, not to join an escalation on behalf of the other side. America should not walk away from the opposition (and U.S. allies) abruptly and without guaranteeing opposition partners some soft landing. The United States should continue to fight Islamic State, but not so single-mindedly and recklessly that it endangers other key U.S. interests. And America must continue to invest in Syrian civilian well-being, inside and outside Syria, both for the sake of those civilians and to mitigate the war’s long-term destabilizing impact on the Middle East and the world. This report expands upon these policy recommendations for the United States as its new president prepares to take office and the Syrian war approaches its six-year mark. The election of Donald Trump as president of the United States appears to be a turning point for U.S. involvement in Syria’s civil war, as well as for Syria itself. President-elect Trump’s policy preferences in a number of areas, foreign and domestic, seem partially formed or subject to revision—pending input from his advisors. But Trump’s stances on the Syrian war and on America’s relationship with Russia have been basically consistent before and after his election and, seemingly, genuinely felt. “I’ve had an opposite view of many people regarding Syria,” he said. Now, irrespective of one’s opinion of Trump’s other public positions and of Trump personally, several of these points are correct. Russia has committed itself to the defense of its Syrian client, the Assad regime. As such, fighting “Syria”—that is, the regime of Bashar al-Assad—could mean fighting Russia. Moscow’s September 2015 intervention on behalf of the regime substantially raised the risk of a great power confrontation over Syria, effectively foreclosing many of the United States’ options for intervening militarily against Assad. The U.S. policy menu had previously included a broader range of military options such as unilateral airstrikes on regime installations, options that were of unclear strategic utility but were, nonetheless, far more feasible than they are today. Overnight, these choices became prohibitively risky, at least relative to their likely effectiveness. And while it is overstatement to say “we have no idea” who Syria’s rebels are, it is true that there is a lot that the United States does not know about Syria’s armed opposition, including groups that are recipients of U.S. support. To the extent that America does understand Syria’s rebels, it is apparent that they are a problematic partner. Nationwide Map November 2, 2016. Source: Agathocle de Syracuse. Click Here for Interactive Map. Western analysts and officials would prefer to neatly categorize rebels as either “moderates” and “extremists.” But the fact is that the local, interpersonal, and familial relationships between rebels remain largely opaque to outsiders, who have a limited understanding of how the many rebel factions relate to each other and exactly what happens to the expansive material support the United States and its allies have sent across the border from Turkey and Jordan. What is known is that U.S.-backed rebels are intermingled with dangerous jihadists, and there is no obvious way to separate them. Because of the opposition’s factionalism, a minority of jihadists is able to exercise outsized influence over the insurgency writ large. And any support for Syria’s armed opposition is likely to benefit jihadists, not, as some argue, shift the intra-opposition balance in favor of more acceptable factions. Despite the United States’ substantial material investment in non-jihadist rebels, it exercises only limited leverage over them relative to more proximate patrons in Turkey and Jordan. A negotiated resolution to the war is impossible because of the nature of both the armed opposition and the Assad regime. The regime remains the most brutal party to the war and is totally intransigent on key political questions. The non-jihadist opposition, while potentially more flexible, still holds to minimum demands that amount to the decapitation of the regime, making negotiations a non-starter. Absent a fundamental change in the character of one or more of Syria’s warring parties, a negotiated resolution to the conflict is vanishingly unlikely. Absent a fundamental change in the character of one or more of Syria’s warring parties, a negotiated resolution to the conflict is vanishingly unlikely. A “soft partition” of the country and decentralization of political control would be desirable, but this seems unachievable in the near or middle term. The United States thus has no positive, stabilizing end-state it can hope to achieve in Syria, at least not in the foreseeable future. Under a President Hillary Clinton, the United States could have pursued objectives in Syria that fell short of “victory” but were nonetheless worthwhile. By continuing to back Syria’s armed opposition—including, indirectly, transnational jihadists—America could have spoiled the work of the Assad regime, Iran, and Russia. To the extent that the regime and its allies are waging war using tactics that are morally offensive and ultimately counterproductive for long-term stability in Syria and the broader region, frustrating their efforts could itself have been constructive. Syria could also have been an opportunity to impose a cost for Russia’s destabilizing behavior worldwide. None of this now seems likely under a President Trump who has made warmer, more cooperative ties with Russia central to his foreign policy agenda. If checking Russia—as well as its Assad regime and Iranian allies—is not to some extent an end in itself, then it makes sense for the United States to more seriously pursue unilateral de-escalation in Syria. In practice, this means the phased and conditional end to U.S. support for Syria’s rebels. At the same time, America needs to be sure it does not simply entangle itself with another deeply problematic Syrian partner, the Assad regime. And it should not commit itself to an opposite—but still-doomed—escalation alongside Russia. Under a President Hillary Clinton, Americans would have had to worry about the United States taking unilateral military action against Assad that would have risked open conflict with Russia for uncertain strategic ends. Under President Donald Trump, Americans need to worry about going too far in the opposite direction. If U.S. Syria policy will be shaped by a larger rapprochement with Russia, then, within those strategic constraints, the United States needs to avoid conceding too much for too little to Russia in Syria. And, critically, the United States must not let itself be enlisted in the Assad regime, Iranian, and Russian war effort. A campaign that aims to defend and restore Assad control using indiscriminate, illegal means does not serve U.S. interests. The regime is not “fighting ISIS” meaningfully or in a fashion that is conducive to American aims. Syria’s east, where the U.S.-led coalition is fighting Islamic State (ISIS, or IS) alongside Kurdish-led forces, is a mostly separate theater. The war on Islamic State is largely unlinked to the central civil war between the Assad regime and the opposition in Syria’s west. The Assad regime and its allies have scored some victories against Islamic State. But they have been and remain focused on defending the regime against all insurgent threats—primarily, the non-Islamic State armed opposition, which poses a more immediate danger to the regime. The Assad regime’s priorities have become those of its international allies, including Russia, and Islamic State is lower on the regime’s list of worries. The United States faces serious, maybe insurmountable challenges in its continuing fight against Islamic State in eastern Syria. America has made its most important gains against Islamic State in partnership with the Syrian affiliate of the Kurdistan Workers’ Party (PKK), which has endangered neighboring Turkey’s stability and gravely strained the U.S.-Turkish relationship. It likely makes sense in the near term to slow the campaign on Islamic State, which is by now mostly contained, in order to manage some of these disruptive second-order effects and avoid the collapse of U.S. gains against Islamic State to date. Teaming with the Assad regime will not resolve these strategic contradictions, nor will it help defeat Islamic State. The Assad regime is a terminally flawed partner, from its depleted military capabilities; to its commission of barbaric, repulsive offenses; to its justifiably toxic reputation regionally and internationally; to its general untrustworthiness. The United States must not, in cooperating with Russia, become the superpower accomplice of the Assad regime. In order to conceptualize a workable U.S. Syria policy in 2017 and beyond, it’s necessary to acknowledge that many of America’s most ambitious goals in Syria are not currently achievable. The United States cannot bring about a stabilizing, negotiated solution to the war, and it cannot perfectly defeat the jihadists now on the loose inside Syria who pose a threat to Americans at home and abroad. Effectively switching sides in the war will not make these goals more attainable. What the United States can do, instead, is work independently and in cooperation with traditional allies to contain the Syrian war’s most dangerous emanations. To that end, America should continue to limit its direct involvement and exposure in the conflict, although it can take action on the margins to achieve specific U.S. aims. Avoid entanglement with the Assad regime. The regime is not a useful or productive partner in service of U.S. ends, and the political price for aligning the United States with the regime and its allies would be unacceptable. America’s campaign against Islamic State and its targeted bombing of specific al-Qaeda targets should remain, as they have been, deconflicted with but operationally separate from the regime and its allies’ military effort. Not give up U.S. support to the opposition for nothing. If the United States is going to disengage from the Syrian opposition, it should not do so for free. The Syrian opposition has been an important partner of the United States, and it remains a source of useful leverage on the Assad regime and its Russian and Iranian allies. To the extent possible, the United States should trade elements of its support for the opposition for a soft landing for its opposition allies and their civilian constituents, which could also mitigate the more dangerous effects of regime victory. Combat Islamic State, but responsibly. There is more work to be done in the fight against Islamic State, both to capture territory at its edges and decapitate its leadership. But it has also lost its last border outlet and is, by any measure, substantially less dangerous. The campaign against the organization must not be so headlong as to have unacceptably destabilizing consequences inside and outside Syria. Prioritize civilian relief and protection. Many of the Syrian war’s long-term negative effects for Syria and the broader region have already been locked in, but what happens next for Syrian civilians inside and outside the country will nonetheless be critically important for their well-being and for regional and global security. The United States must continue to lead its allies in providing humanitarian and stabilization assistance to Syrians across the country and for the millions who will remain outside it as part of a permanent refugee diaspora. And the United States should encourage Syria’s neighbors—with appropriate incentives, if necessary—to allow the exit of Syrians who cannot be safely reintegrated in regime-controlled Syria. Syria’s warring parties—chief among them, the Assad regime—have loosed horrific brutality on the country’s people, from relentless, indiscriminate aerial bombing2 to industrial-scale torture of detainees3 to high-definition video beheadings. The war has supercharged jihadist militancy worldwide and overwhelmed and destabilized Syria’s neighbors. For Syrians, the scale of the disaster is difficult to exaggerate. There is no reliable count of how many Syrians have died in the war, but estimates of over 470,000 seem plausible, with almost 2 million more wounded.4 More than half the country’s people—over 10.5 million—have been driven from their homes, either displaced inside Syria or in neighboring countries.5 Much of Syria’s next generation6 is likely to grow up with intermittent or no education7 and, in some instances, no experience of living under state order. Syrians are now living in and between two separate, mostly disconnected wars, on either side of the country. In Syria’s west, the Assad regime and its allies are fighting a mix of nationalist and jihadist rebels. The east has lately been a war between Kurdish-led forces, backed by the U.S.-led international coalition, and Islamic State, although now the attention of both sides has turned elsewhere. The war in the west—for and against the Assad regime—is Syria’s central, crucial conflict. All of Syria’s other local wars exist in its penumbra. In the west, the regime is on the front foot. It has successfully neutralized nearly all the remaining pockets of rebel control within the key western corridor running from the Syrian coast down through Homs to the capital Damascus. For years, the regime starved and bombed most of these areas into cutting lopsided deals for limited and progressively decreasing degrees of local autonomy. Now it is imposing final settlements on these towns, endgame deals8—backed by the threat of overwhelming military force—that entail the full restoration of state authority9 and the bussing of any irreconcilable militants to rebel-held Idlib province in the country’s north.10 With these rebel enclaves winking out one by one, the regime’s control of many of the country’s most populous, economically relevant areas is now basically unchallenged. Syria’s mixed rebels still hold large sections of territory along the country’s northern and southern borders with Turkey and Jordan, respectively, as well as in a few mostly contained pockets in the middle west. But rebels in southern Dara’a and al-Quneitra provinces, next to Jordan and Israel, have been defanged. The Southern Front rebel coalition had been, to many, a model11—a conglomeration of overwhelmingly “Free Syrian Army” (FSA) nationalist rebels that had successfully marginalized harder Islamists and jihadists. Then Jordan, which exercises near-total control over military and humanitarian supplies to the south, reportedly reached a deal with Russia late last year to neutralize the fronts parallel to its Syrian border.12 Since then, southern rebels have periodically launched half-hearted attacks on the regime, but have mostly stood down as the regime has trained its fire on rebels around Damascus and in Syria’s north. Rebel inside Aleppo city fires at planes overhead. Source: @Zenky_Lens. The regime’s campaign to capture Aleppo seems to be deliberately aimed at frustrating any plans to partition the country into viable, contiguous zones of control. The Assad regime has staked its existence on its claim to be the sole sovereign authority over the entirety of Syria. Hence its insistence on paying public sector wages to Syrians across the country—maintaining their continued link to the Syrian state—and, in the east, its operation of government offices in Kurdish-held al-Hasakeh province and its stubborn refusal to cede the western half of Deir al-Zour city to Islamic State. The regime’s capture of Aleppo should put an end to any wishful thinking that it plans a retreat to a western coastal statelet, or an “Alawistan.” The regime will have retaken the country’s most important economic and population centers. Rebel territory will mostly be reduced to an archipelago of rural, peripheral areas. Idlib is jointly dominated by the Fateh al-Sham Front—formerly Syrian al-Qaeda affiliate the Nusra Front16—and opposition faction and Islamist movement Ahrar al-Sham. Ahrar al-Sham has roots in internationalist Salafi-jihadism but has adopted a purely Syrian focus and aligned itself with the Syrian opposition mainstream.17 The two compete for influence across the province, even as they coordinate militarily.18 Together, they lead the Army of Conquest alliance, which captured Idlib’s provincial capital and drove the regime out of its remaining strongholds in the province in early 2015. Fateh al-Sham fighters prepare to storm west Aleppo. Source: Fateh al-Sham Front Telegram. Rebel factions up and down Syria’s west range from FSA nationalists to full-bore al-Qaeda-aligned Salafi-jihadists, but they also resist any neat internal categorization. There are clear qualitative differences in attitude and conduct between fighters from the Fateh al-Sham Front and members of local FSA units, but factions of all types recruit from the same families and communities. Many FSA fighters old enough to have joined the initial militarization of the revolution in 2011 and 2012, before these factional and ideological distinctions calcified, fought alongside other motivated young men who have now run up the jihadist black flag. All these factions are intermingled and, to varying extents, collocated throughout rebel-held territory. They frequently coordinate militarily, although factions such as Fateh al-Sham opt to collaborate mostly closely with factions that are more similar to them ideologically. The Fateh al-Sham Front—despite the show it made of cutting ties to al-Qaeda—remains firmly within the Salafi-jihadist milieu, committed to unending global war against the enemies of Islam. It is dedicated to dismantling the state order in the Muslim Middle East and beyond, even as its immediate focus remains inside Syria. A number of smaller jihadist factions follow in its wake, such as the Uighur Chinese Turkistan Islamic Party. Most northern factions—minus Ahrar al-Sham, jihadist factions, and several others that have been specifically excluded—are supplied with weaponry and stipends by a joint intelligence cell called the Müşterek Operasyon Merkezi (Joint Operations Center, or MOM), which includes representatives from the CIA and various allied intelligence services.20 Exactly what happens to these foreign-supplied arms when they enter the country is unclear. At least some of this equipment regularly leaks to Fateh al-Sham and others,21 although the most high-profile, advanced weaponry—including U.S.-made antitank TOW missiles—seems to have only proliferated in rare instances. But even foreign arms used by their specific, intended recipients often benefit factions like Fateh al-Sham indirectly, as smaller FSA factions backfill for larger, more dynamic Islamist and jihadist factions or play an auxiliary role in joint operations led by Ahrar al-Sham and Fateh al-Sham. 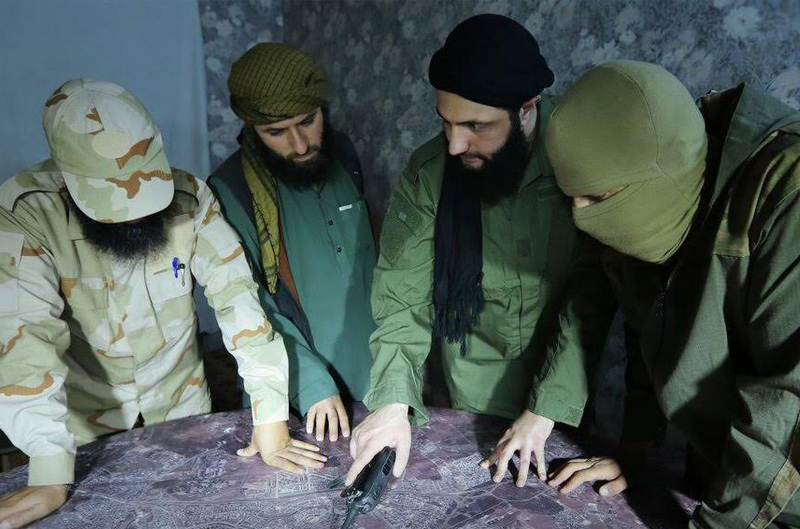 Fateh al-Sham Front head Abu Muhammad al-Jolani meets with commanders to discuss battle for Aleppo. Source: @dlockyer. Despite simmering tensions between more mainline rebels and Salafi-jihadist factions led by Fateh al-Sham, any real confrontation would fatally weaken the opposition’s fight against the regime and is seen as impossible. In January 2014, open war erupted between rebels and Islamic State across the Syrian north. Islamic State was driven from the northwest, both through force of arms and some quiet local arrangements. Yet the ensuing war of attrition with Islamic State cost rebels hundreds, maybe thousands, of fighters and the entirety of their territory in the east of the country, including the lucrative oil resources of the Euphrates river valley. The regime is now prosecuting the war with a mix of its conventional military forces: in particular, a handful of elite military units; locally recruited paramilitaries, organized and sponsored by regime-linked business elites,26 the regime’s security services,27 and foreign actors;28 Iranian ground forces and foreign Shi’ite militias mustered by Iran; and Russian forces, including Russian aircraft flying regular bombing runs from the refurbished Hmeimim airbase. The regime does suffer from a real manpower deficit, the result of a handful of reliably loyal constituencies being ground down by years of war and of military-age men fleeing the country to avoid indefinite conscription into the Syrian Arab Army. The regime has addressed the weakness of its conventional forces in part by relying on para-state, local, or privately funded militias, some of which fund themselves through criminal economic predation. Some analysts have argued this reliance on auxiliaries is an outward marker of the regime’s internal rot.29 Now, the inner workings of the regime are opaque, but, to the best of my knowledge, this “militia-ization” is not evidence of weakening regime cohesion. The regime has always functioned on competition between various centers of power, including its four overlapping security services. The churn that is now taking place—as militia entrepreneurs and minor warlords install themselves as local bosses and angle for positions inside Syria’s superstructure of influence—is mostly taking place in the regime’s lower tiers. These militias are allowed substantial autonomy, but, if they overstep their bounds, the regime seems able to break them. Critically, and in an important contrast with rebel forces, all the forces fighting for the regime seem to be part of a coherent command-and-control structure. The regime now presides over a likely majority of Syria’s population,30 including hundreds of thousands of displaced people from elsewhere in the country.31 Syrians still living under the regime remain for a number of reasons, ranging from genuine political support for the Syrian state; to dysfunction and hardship in rebel-held areas, which are subjected to periodic regime aerial bombing; to fear of insurgents run amok, particularly among religious minorities and known supporters of the regime. Life continues semi-normally in these regime areas, although the influx of displaced people has strained local services and the collapse of the Syrian lira32 has meant that many residents, including those surviving on public sector salaries, now struggle to afford rent and staple foods.33 Absent some form of economic normalization and an infusion of foreign investment, the Syrian economy seems likely to gradually deteriorate further. But a total and sudden economic collapse does not seem imminent and would presumably be forestalled by a cash infusion from Iran. In these areas, the regime’s security apparatus—complete with arbitrary detention and torture to death34—appears to still operate with no reform or accountability. Rebel-held areas are kept semi-functional by a mix of city- and town-level municipal councils, relief organizations, and charities, although the ongoing war and, in particular, the regime’s indiscriminate aerial bombing make normal civilian life impossible.35 Above the local level, there is very little governing connective tissue. Some unifying province-level or national bodies exist, but their effective reach is limited, either because of scant resources or because, in some cases, their authority is resisted by armed factions on the ground. Local civil society and activism persists, but its most controversial expression—critical, independent political and social activism, as opposed to things like relief work—has been suppressed in many areas. The armed factions with the most problematic visions for the country, politically and socially, are typically the ones best-positioned to define rebel political order. The opposition’s most important recent gains—the sections of Idlib captured by the Army of Conquest coalition—have been governed jointly by the Army of Conquest’s factions, including Fateh al-Sham, which have presided over a civilian administration and a limited, functional role for civilian bodies like the Coalition and the Idlib Provincial Council. The experiment has reportedly been hobbled by inter-factional jostling and only partially functional. To the extent that the opposition has a unifying vision, it is mostly a negative one—the removal of Assad and the dismantling of the regime’s coercive security apparatus.36 Beyond that, there is little consensus. The regime’s outlook, meanwhile, is both more coherent and more unforgiving. I returned from a recent visit to Damascus convinced that the regime is immutable.37 It has not improved or changed, and it does not seem capable of compromise. What it has offered to its constituents is a reproduction of its pre-war authoritarian order, largely unamended, except in more materially desperate straits and with a fraction of the population. Syria’s east is now effectively divided between the Syrian Democratic Forces (SDF), which are dominated by the Kurdish People’s Protection Units (YPG), and Islamic State. With backing from the U.S.-led international coalition, the SDF have pushed Islamic State back from Syria’s Turkish border and, in the process, joined a string of Kurdish enclaves to form a federation of “cantons” in “Rojava,” or Western Kurdistan. Contiguous Rojava stretches along the Turkish border from the Euphrates River, Syria’s midpoint, to the country’s far northeast corner in Qamishli. Female SDF Commander Radios her Comrades in North al-Raqqa. Source: ypgrojava.org. Thanks to the SDF’s gains and, now, Turkey’s intervention in east Aleppo, Islamic State has lost its last border outlets to Turkey. Yet it still holds territory stretching up through the Euphrates river valley from Iraq; past its urban nerve center in Syria, al-Raqqa; and into the eastern Aleppo countryside. With Russia’s help, the Assad regime was able to drive Islamic State from its most dangerous Homs foothold in western Syria and from the desert crossroads city of Palmyra, but Islamic State nonetheless continues to attack and harass regime forces in the country’s central desert waste. The regime still holds a few pockets of territory in the east, including sections of PYD-controlled urban centers and a piece of Deir al-Zour city besieged by Islamic State. But in all these areas, the regime is mostly fighting to hang on and maintain some symbolic presence, not to recapture large sections of the east. Opposition rebels haven’t existed in eastern Syria since summer 2014. Both Islamic State and the YPG have been successful, in large part, because of their coherence. Both Islamic State and the YPG have been successful, in large part, because of their coherence. In contrast to the unmanageable factional mix of Syria’s rebels, both Islamic State and the YPG can claim unitary command over capable, motivated fighters, and each have imposed a political order that makes predictable sense in the areas of their control. Although Islamic State has lost key territory at its periphery and been weakened by a campaign of coalition bombing, it continues to put up spirited resistance militarily.38 Its jihadist security state—complete with a redistributive welfare apparatus, Islamic courts, and internal security service—appears to remain mostly functional in its remaining core areas of control. Islamic State seems to have persisted largely because of its enemies’ political contradictions,39 as well as its own success at liquidating any potential rivals inside its Sunni Arab constituency in areas of its control. It fairly thoroughly broke the east’s rebel factions, absorbing some and massacring others. Those left were scattered across a dozen different factions and alliances up and down the country or run into permanent exile. There is no locally rooted and demographically representative—that is, eastern Sunni Arab—faction that can seriously challenge Islamic State in al-Raqqa province and Deir al-Zour. 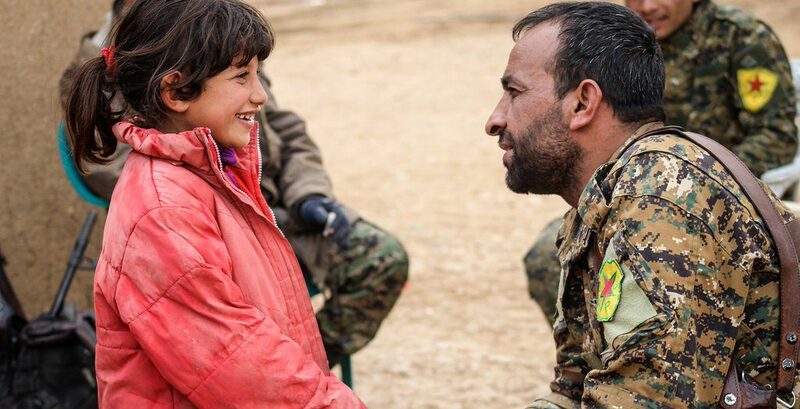 YPG Commander Shakes Girl’s Hand in Al-Hasakeh Area Captured from Islamic State. Source: ypgrojava.org. The more inclusive “SDF” brand was apparently adopted at the prompting of the United States military.41 It includes an assortment of smaller local Arab factions dubbed the “Syrian Arab Coalition,” which serve as junior auxiliaries to the YPG and which the United States supplies directly with arms.42 The YPG is not considered legally “vetted” by the United States and thus receives only air support, not direct material support. Since their dramatic defense of the town of Kobani against an Islamic State assault in late 2014 and early 2015, the YPG has enthusiastically accepted air support from the U.S.-led coalition as it has joined together the pieces of Rojava. Though the PYD has floated its decentralized federalism as a possible model for all Syria,43 the PYD seems to be the only one of Syria’s main factions that doesn’t aspire to control the entirety of the country. What it wants, instead, is a contiguous, defensible stretch of territory that runs along most of Turkey’s border and combines the three Kurdish cantons in northern Syria;44 all that remains is for the SDF to take “al-Shahba” (the eastern Aleppo countryside) to reach Afrin, an isolated pocket of SDF control in the northwest corner of Aleppo province. The PYD is widely viewed by Syria’s other factions as both an ally of the regime and an ethnic separatist movement,45 a perception it has aggravated by unilaterally declaring its own federalist system. In line with PKK chief Abdullah Ocalan’s most recent ideological revisions, it officially espouses the devolution of political authority to the local level within the Middle East’s existing state borders and the peaceful coexistence of the region’s ethnic “components.”46 The PYD has established a set of decentralized, “democratic”—that is, ethnically inclusive—courts and governing councils on the Ocalan “Apoist” model47 and subsidized in part by the Assad regime, which continues to operate some government offices and pay salaries. Both Islamic State and the PYD/YPG are preoccupied with a conflict other than the core Syrian war. The PYD/YPG fights Islamic State and has periodically clashed with Assad regime forces,51 but it seems to understand its war as primarily one with Turkey and with rebel factions it considers Turkish jihadist proxies, ranging from Islamic State to Ahrar al-Sham to Turkmen FSA units. Islamic State, meanwhile, is waging an omni-sided campaign against the Assad regime, Syria’s rebels, al-Qaeda, Jordan, Turkey, Iraq, the United States, and dozens of others. For Islamic State, the Assad regime is just one enemy among many, and certainly not among the main threats it faces inside Syria. The Syrian war’s eastern and western theaters are now intersecting in unpredictable, perhaps dangerous ways in the northern and eastern Aleppo countryside, which looks to be a free-for-all between Turkey, Syrian rebels, the SDF, the regime, and Islamic State. East Aleppo, and Euphrates Shield specifically, is a sort of hybrid of Syria’s eastern and western wars. Turkey has recruited opposition rebels to man Euphrates Shield, including rebels transported through Turkish territory from Idlib to north Aleppo. But those rebels have been deployed, to a large extent, in service of Turkish security objectives unrelated to the fight against the Assad regime. Euphrates Shield rebels on the move. Source: @shamfront. Now Euphrates Shield forces and the SDF in Afrin are each racing for the key city of Islamic State-held al-Bab, and they have already turned their guns on each other. Al-Bab seems to be the southernmost end of the territory Russia is willing to allow Turkey to capture. If the regime advances on al-Bab, Turkish-backed rebels may find themselves once again face-to-face with the regime. Otherwise, those rebels may have just contributed to anti-SDF blocking maneuver, and maybe the prelude to a larger confrontation between Turkey and the SDF around the east Aleppo city of Manbij. The Obama Administration has avoided being drawn into a Syrian quagmire in at least one relevant sense: aside from limited numbers of U.S. special forces, the Obama Administration has avoided deploying American troops in Syria in large numbers. Even as U.S. Syria policy has failed by most other metrics, at least there have been almost no American soldiers dying in service of a set of amorphous, unachievable objectives, which is an underappreciated silver lining. Yet the United States is otherwise extensively involved in Syria, albeit in ways that minimize America’s direct exposure to blowback and—related—have a limited impact on the overall arc of the war. But too often, the debate over U.S. intervention in Syria devolves into a re-litigation of past decisions people didn’t like. Regardless of the ultimate wisdom of those choices, they have substantially constrained the United States’ current and future policy options. Conditions inside Syria—including the shape and character of the Syrian opposition—and the posture of other key regional and international actors are materially different coming into 2017 than they were in 2013. Of the four main camps inside Syria, the United States has partial entrée with only two: the rebels and the PYD. But it doesn’t make sense to overstate the extent to which either of them can be considered U.S. “proxies,” and each comes with its own limitations. The PYD is, by all accounts, transactional, and the United States has so far made an effective, mutually beneficial transaction with it. The YPG has energetically fought Islamic State and, with the United States’ help, taken nearly all the territory it already wanted. The United States has also accorded the PYD international legitimacy, deflected Turkish hostility, and has provided continuing air support that has helped the overstretched YPG hold its long, incompletely defensible line against Islamic State. But Turkey seems to have had its fill of the PYD’s U.S.-enabled expansion. And not unreasonably—Turkish domestic political dynamics seem to have been the most proximate cause for the 2015 collapse of the Turkey-PKK peace process and the return to low-intensity civil war in Turkey’s southeast, but the PYD/YPG’s coalition-enabled success in Syria seems to have raised the ceiling of the PKK’s ambitions in Turkey and further inflamed a conflict that is a genuine menace to Turkey’s stability and territorial integrity. When Turkish president Recep Tayyip Erdogan promises to clear the PYD/YPG from the east Aleppo city of Manbij—captured from ISIS with coalition support and, for the YPG, at serious human cost—and create a “terror-free zone,”65 he is confronting what the Turks are convinced is a grave threat to Turkey’s own security, one the United States has exacerbated out of reckless disregard for its NATO ally’s well-being. Still, it’s not as if the U.S. supported the Syrian affiliate of a designated terror organization only to provoke Turks. There has been some hand-wringing about U.S. backing for the YPG and the need to, instead, engineer a more ethnically representative and locally popular force to capture and hold Arab areas controlled by Islamic State. But there has also been a rationale for a go-fast approach, particularly when Islamic State returnees pose an imminent homeland security threat and when each year of Islamic State control means more Syrian children are irreversibly acculturated to Islamic State doctrine. There was and is no capable and motivated Arab “Unicorn Force” acceptable to Turkey and ready to make these necessary gains in Syria’s east. And Turkey has itself been a reluctant and sometimes unhelpful partner against Islamic State. Support for the YPG came at a serious cost in terms of Turkish stability and America’s relationship with a strategic ally, but it’s not clear that cost wasn’t worth paying. As for Syria’s rebels: With the possible exception of a handful of train-and-equip forces and despite America’s substantial covert investment, none of them actually answer to the United States. The jihadists seem almost entirely beyond anyone’s control, and to the extent that most non-jihadist rebels are “proxies,” they are Jordanian and Turkish proxies, not American ones. All the effective leverage on these rebels runs through these neighboring countries, on which these rebels depend for continued material support and cross-border safe haven for their men and families. Deep-pocketed Qatar and Saudi Arabia also get a vote, but, like the United States, they project influence through Jordan and Turkey. Both Jordan and Turkey seem to have revised their overall posture on the Syrian war, although it remains to be seen how their positions will further evolve and how they will line up with a U.S. policy that is itself in flux. But rebels have little choice but to adopt the politics of their more proximate state patrons. The United States will, in degrees, eventually leave. Turkey and Jordan are going nowhere. Jordan is reportedly concerned primarily with de-escalating opposite the regime and Russia—thus avoiding further destabilizing refugee flows—and waging a proxy fight against Islamic State tentacles closest to its border. Its positions also likely reflect the preferences of Israel, which seems most concerned about an Iranian and Iranian presence adjacent to the Israeli-occupied Golan Heights. The catalyst for both Jordan and Turkey’s reorientation on Syria was Russia’s September 2015 intervention, which fundamentally changed the strategic balance in Syria.66 Turkey, for its part, had pushed for a “safe zone” in the eastern Aleppo countryside in summer 2015, only to be met with U.S. misgivings and foot-dragging.67 Now Turkey has secured its Aleppo safe zone in the only way that remains feasible: working with and through Russia. Russian Defense Minister Gen. Sergei Shoigu meets President Bashar al-Assad. Source: Ministry of Defence of the Russian Federation. Though Russia initially framed its intervention in terms of the campaign against Islamic State, it became apparent almost immediately that Russia meant to defend the Assad regime against all insurgent threats, from Islamic State to the Nusra Front to FSA rebels. This approach has its own internal consistency: By Russia’s thinking, any settlement or transition must be achieved through the existing institutions of the Syrian state which, if destroyed, will be impossible to rebuild. Russia views Syria’s rebels as hopelessly enmeshed with irreconcilable jihadists and, therefore, is unimpressed by Western attempts to thin-slice and micro-segment a hundred different “moderate” and “extremist” rebel factions by ideology or politics. Russia may endorse a negotiated solution, but it would be one that essentially amounts to capitulation by reconcilable opposition constituencies. Moreover, Russia’s determined intervention on behalf of the Assad regime—with an international legal mandate, per the invitation of its state host—and, in particular, its deployment of modern, integrated air defense systems in Syria made overt foreign intervention against the Syrian state substantially more risky.71 For the United States to implement a no-fly zone over Syria or carry out most strikes against regime targets, it would have had to either preemptively suppress—that is, disable or destroy—air defense systems operated by Russian personnel; test U.S. aircrafts’ stealth capabilities and countermeasures against the Russian S-300 and S-400; or assume that Russia’s threats to act72 were a bluff. Even cruise-missile or standoff strikes launched from beyond Russian systems’ engagement radius would have necessarily endangered Russian personnel deployed throughout regime territory and risked an escalation with Russia. With minimal leverage, the United States therefore pursued mostly bilateral “Geneva” negotiations with Russia. Within the Geneva framework, the United States and Russia were each responsible for delivering their respective allies to the negotiating table, as well as ensuring those allies’ compliance with confidence-building measures including two nationwide “cessations of hostilities.” The U.S. investment in the Geneva track was an implicit acknowledgement that, absent the willingness to directly challenge Russia and potentially spark a great-power showdown over Syria, any solutions ran through Russia and Russian pressure on its Syrian regime proxy. Yet unsurprisingly,73 talks ultimately stalled and the cessations of hostilities repeatedly collapsed, largely because of Russia and the United States’ limited leverage over their intransigent Syrian allies and over uncooperative regional states.74 The United States has since tested the multilateral “Lausanne” track, although the fate of all diplomatic efforts is an open question post-Obama. Lausanne at least involved and could have served as a standing contact group between key regional stakeholders, including Saudi Arabia, Turkey, Qatar, and—at least initially—Iran. Iran, which has not participated in Lausanne’s follow-up technical meetings, seems both absolutely necessary to any resolution to the war and unlikely to have its interests sufficiently represented in bilateral negotiations by Russia. Yet Iran also seems uninterested in a negotiated end to the war, even on Russia’s lopsided terms. It has consistently pushed for an outright regime victory, both directly, with its own money and men, and through substate allies such as Lebanon’s Hizbullah and various foreign Shi’ite militias. For Iran, the stakes in Syria border on existential. Syria is Iran’s main Arab state ally and its sole avenue to resupply Hizbullah, which, in turn, is an integral part of Iran’s deterrent capability against Israel and its Western allies. Iran also wants to head off the establishment of an extremist Sunni state in Syria, which would necessarily threaten Shi’ites in Lebanon and Iraq. Iran may not need Assad to control the entirety of Syrian territory to satisfy its own ends, but on the integrity of the Assad regime, it has evinced no willingness to compromise. It is Iran—not Russia—that seems to be most in sync with the regime’s strategic thinking. And as a hedge, Iran has been busy building parallel structures, including various paramilitary auxiliary forces, through which it seems likely to exert additional leverage inside Syria in the future. The United States’ core interests in Syria are: Counterterrorism; the stability of regional and European allies; and, to the extent possible, civilian safety and well-being inside Syria and in its neighbors. The policy argument below is framed in terms of U.S. policy and interests, which is not to imply that the United States is uniquely virtuous or that its interests are uncontroversial and universally shared. And, it is worth noting, the United States’ interests in Syria are not synonymous with those of any of Syria’s warring camps, including the Syrian opposition and the PYD/YPG. U.S. counterterrorism aims have, most obviously, driven its military campaign against Islamic State and its bombing of key al-Qaeda leadership in Syria’s northwest. But they have also informed U.S. efforts to effect a political transition away from the Assad regime, which would allow for the de-escalation or end of Syria’s war and the isolation and targeting of jihadist irreconcilables. Per the conventional wisdom among U.S. officialdom and the analyst community, it is impossible to isolate and eliminate jihadists in Syria so long as the Assad regime—the main polarizing, destabilizing force in the country—remains in power. This argument is mostly correct, although it has been somewhat overstated. It is true that there can be no sustainable, inclusive political order so long as Assad remains in power and the structures of the regime are intact. Absent that sort of post-Assad order, it will be impossible to deprive the jihadist organizations now active inside Syria of their bases of popular support and, thus, to totally and permanently defeat them. But Assad’s survival or victory does not somehow translate into an indefinite upward trend in jihadist militancy inside and outside Syria. New advances by Assad will partially disrupt and suppress organizations like Fateh al-Sham and Islamic State, particularly if the regime is able to seal its borders and recapture enough territory to deny these groups space to recruit and organize.75 If Assad wins, these groups will persist, and Syria will likely be wracked by a continuing, low-level insurgency. Eventually, that could metastasize into a new mass uprising, maybe more radical than this one. But the idea that these groups’ defeat will translate directly and immediately into a more serious jihadist threat seems unreal. There is concern that an internationally sanctioned Assad victory would validate jihadists’ narrative and somehow lend them additional popular force. But in terms of jihadists’ real capabilities and reach, there are practical considerations that are more relevant. The Assad regime’s terrible behavior is an important mobilizing force for jihadists inside Syria and abroad, but what these organizations need most to fight the regime and to launch external attacks is a safe haven, a chaotic void in which they can operate openly. A Syrian opposition that is further radicalized by Assad victories and international betrayal—but is also reduced to dramatically smaller remnants and driven into isolated mountain redoubts—is unlikely to be more dangerous than an opposition that provides a permanent explosives lab and staging ground for al-Qaeda. Insofar as the causal relationship between Assad’s rule and transnational militancy has guided U.S. and allied policy, its logical conclusion seems to have been inverted. It doesn’t make sense to work backwards from the need to defeat jihadism in Syria and conclude that America therefore needs Assad’s removal and an inclusive political settlement. Rather, one ought to work forward from the impossibility of Assad’s removal and an inclusive political settlement and conclude that the problem of radicalism in Syria is not entirely solvable. Assad’s removal and a political transition are prerequisites for the total defeat of Syria’s jihadists, but they are also unachievable. Total victory against those jihadists is also, therefore, unachievable. If the United States is going to set out realistic goals and meet them, it needs to aim for an incomplete but good-enough victory over groups like Fateh al-Sham and Islamic State. The danger these groups pose cannot realistically be brought to zero, but it can be reduced to the point where it is manageable and non-significant. In this sense, America’s campaign to date against Islamic State and its partnership with the YPG is a model for this sort of good-enough approach. PYD-YPG control of large, ethnically mixed sections of northern Syria along the Turkish border is not an ideal or fully tenable endstate. It is likely to invite challenge from within and without, as restive constituencies within “Rojava” chafe at continued PYD control—maybe inviting Islamic State infiltration—and Turkey takes action against the PKK safe haven along its southern border. But these are problems that can potentially be managed, by, for example, withholding support from the SDF or making frantic calls to Turkey. And in the meantime, the U.S.-led coalition’s collaboration with the YPG has led to major gains against Islamic State that have substantially reduced the threat it poses inside and outside Syria. A PYD-/YPG-centric strategy is not how anyone would imagine fighting Islamic State in some blue-sky strategy exercise, but it has been the best approach available in difficult circumstances. There is an important corollary to scaling back U.S. ambitions in Syria and recognizing that glorious total victory is not possible: The United States should not do anything reckless or self-destructive in service of partial or incremental gains. There are some risks the United States could take in Syria that would be tolerable if they could realistically yield permanent solutions. Short of that, they are not worth it. A political transition and a negotiated end to Syria’s central civil war are not realistic goals, and the United States should not make its objectives in Syria conditional on achieving them. The acceptable minimum demands of both the Assad regime and the Syrian opposition are irreconcilable. No settlement between the two is possible that is not preceded by the defeat of one of the two sides. Much of this has to do with the fact that the person of Bashar al-Assad is indivisible. The removal of Assad is the rock-bottom unifying demand of the opposition. All formulations for a negotiated solution advanced by the opposition or their backers have amounted to an opposition victory, in that they ultimately require Assad’s removal. The regime’s supporters counter that Assad is personally indispensable, the central node in the networks of influence that hold together the Syrian state, and that his removal could fatally destabilize the country’s remaining institutions. This narrative is self-serving, obviously, but it’s not obvious that it’s wrong. The upshot is that the regime and its supporters will not sacrifice Assad, and the regime’s state backers will refuse to roll the dice on their client state’s continued survival. This security dilemma is irresolvable by any practical means. Yet even if Assad could be removed without threatening the integrity of the state—or if elements on both sides are, privately, less maximalist behind closed doors—there is no compromise formulation for a unified Syrian state that can address the existential fears of either side in the war. This security dilemma is irresolvable by any practical means. To take just one key example: Given the (entirely reasonable) collective security fears of Syria’s Alawites, it seems impossible that they would cede control of all four state security services. But there’s a reason why the opposition’s minimum demands include not just Assad’s removal, but also the restructuring of all the regime’s security services. So long as Alawite loyalists hold Air Force and Military Intelligence, members of the opposition will never be safe. In theory, you could resolve some of these issues through federalization or geographic decentralization—for example, the exclusion of specific regime institutions, including the security services, from opposition areas that would be folded into a loose federal framework. But with some specific exceptions, geographic decentralization based on current lines of control and in the near and middle terms is unrealistic. The Assad regime and key opposition constituencies remain committed to total victory over all of Syria. Until they are exhausted, they will fight on. If a negotiated settlement is not going to happen, then the United States needs to re-examine its rationale for supporting Syria’s armed opposition. From a U.S. policy perspective, the Syrian opposition is neither a viable alternative to the Assad regime nor an effective means to bring the regime to the negotiating table. The Syrian opposition includes a lot of good people, people whom, for years now, I’ve known and liked and rooted for. But the problem of extremist influence is real. By this point, effective power within the opposition rests with the opposition’s armed factions. The armed opposition is led by actors that the United States cannot reasonably support, such as Ahrar al-Sham, or that are a real and present danger to international security, such as Fateh al-Sham. It is these factions that are poised to capitalize on major new opposition gains. The problem of jihadist influence within the opposition is not something the United States can fix. Greater Idlib is the future of the armed opposition. (Euphrates Shield in the eastern Aleppo countryside seems to have limited prospects for expansion, and in any case is a Turkish weapon aimed at the PYD.79) The factions in Syria’s northwest cannot plausibly challenge Fateh al-Sham, individually or collectively. And if the United States attempts to build up an anti-jihadist champion from within the FSA armed opposition, Fateh al-Sham will destroy it. There also seems to be no solution to the chronic disorganization and division of the Syrian armed opposition, a large part of why jihadists have been able to exert outsized influence. At this point, the centrifugal forces working against rebel coherence—money, ideology, individual personalities—are too much. The opposition’s factional dysfunction and infiltration by jihadists mean it isn’t a useful tool to pressure the regime to negotiate seriously. The regime seems unlikely to have ever compromised with any opposition, military or civilian. But now it is facing off against an armed opposition of which large sections—jihadists, obviously, but also some non-jihadists with a revanchist agenda—are a would-be exterminationist threat to the regime and its core constituencies of support. In terms of Syria’s central regime-opposition civil war, by late 2016 the United States no longer had anything constructive to achieve in Syria. The United States could not arm or bomb its way to a stable, consensual order in Syria, democratic or otherwise, nor could it present a desirable alternative to the Assad regime. There was already little America could do to “win” in Syria. What America could have done earlier is use tools like the covert arms program to ensure the Assad regime, Russia, and Iran did not win, either. There was no longer an offensive rationale for backing the opposition, either to capture more territory or to pressure the regime into negotiating. But there was a defensive or reactive rationale, to empower the opposition to stave off a regime victory. This would not necessarily have been un-worthwhile, given that the regime and its allies’ aims are abhorrent and run counter to a stabilizing solution in the long term. The United States could have blocked the regime’s attempt to retake the entirety of rebel-held territory, which, in terms of opposition Syrians killed and detained en masse,83 could be more costly than even years of continued war. Hurting the regime would at least have sent a message to the regime and to other would-be bad actors that the regime’s systematic, horrendous violations of Syrians’ rights and of international norms were not acceptable or cost-free. The United States’ most useful tool—at least in service of these reduced, reactive objectives—would have been its covert arming program. But this program is a blunt instrument: There is no such thing as purely defensive weapons, and so there would likely have been ebbs and flows on the battlefield in time with periodic upticks in arms supplies. This course would have been basically incompatible with a counterterrorism strategy aimed at non-Islamic State jihadists, specifically Fateh al-Sham. In practice, it would have meant subsidizing a jihadist haven in northwest Syria, albeit one that could be largely contained by Turkey with American technical assistance.84 Any influx of arms and other support for rebels would have necessarily, albeit indirectly, benefited jihadists.85 The United States could have periodically launched targeted assassinations of specific international jihadists, as it does now, but there would have been no plausible way it could roll back jihadist influence in these areas. Yet the covert arms program also would have allowed the United States to continue to cultivate partners on the ground inside Syria, which would have ensured Washington had a foothold in the conflict. Fateh al-Sham is unlikely to absorb the entirety of the armed opposition, if only because it, too, depends on foreign support to non-jihadist rebels; Fateh al-Sham simply does not have the resources to finance the entirety of the armed opposition. Non-jihadist factions will continue to be players on the ground, even if they are overshadowed by more hardline factions. Through its continuing covert involvement, Washington could have signaled its commitment to non-jihadist factions it does and does not support—with whom relations can be productive86—and to regional allies who might otherwise pursue destructive policies unilaterally. More than any Syria-specific goals, some of the most compelling rationales for continuing U.S. action in Syria were based in America’s ex-Syria rivalries with Russia and Iran. The United States could have acted to Syria to complicate Russian expansionism in the Middle East and elsewhere, or to attrite Iran and break its logistical link to Hizbullah. There was no Syrian reason that could justify provoking Russia in Syria. But if the United States had decided to push back on Russia worldwide and needed somewhere to do it, then Syria could have been the place. Under President Trump, this larger strategic logic seems unlikely to be persuasive. It is unclear how Trump plans to reconcile his desire to reach out to Russia with his unfriendliness towards Iran, at least in the Syrian context. Given Russia and Iran’s parallel investment in the Assad regime, it is not possible, in practical terms, to work with one country and against the other.87 But at a minimum, it seems that obstructing Russia’s aims in Syria (and, by association, those of the regime and Iran) will not be a priority for America. Whether and how President-elect Trump will seek a rapprochement with Russia is an issue that is bigger than Syria. There are good reasons not to fall head-over-heels for a Russia that violates American values and international norms of sovereignty.88 But if America’s relationship with Russia is about to improve dramatically, then, within that new global strategic context, America needs to chart a policy course in Syria that responsibly secures U.S. interests. That should not mean throwing America’s support behind the Assad regime, directly or indirectly. There is a crucial difference between, on the one hand, deliberately frustrating the efforts of the regime, Russia, and Iran; and, on the other, declining to place American power in service of their parochial aims. Even if the United States is no longer interested in doing the former, the latter still makes sense. Some will argue for partnering with the Assad regime and its allies in order to bring the war to a swift conclusion and to spare unnecessary human suffering. Others may claim that an American realignment would allow for a new, more productive alliance against Islamic State. In fact, the United States seems unlikely to get much from new cooperation with the regime axis. The regime has neither the capacity nor the inclination to effectively combat Islamic State in Syria’s east. Russian airpower has enabled the regime’s depleted military and its various auxiliary allies to realize some gains in Syria’s west, but the regime still has a long way to go to capture and pacify the west Syria insurgent strongholds that pose the most serious threat to its control. Jihadist radicalism will remain, albeit in a reduced form, and it will poison the refugee diaspora. If the regime actually manages to grind out a win in the west, it will be ugly and costly, and holding these areas will be a continuing drain of resources and manpower. The regime’s work will be made easier by a sort of self-cleansing, as opposition Syrians flee to Syria’s already-shaky neighbors, which will be further destabilized by a massive new wave of displacement. But even what’s left of these half-destroyed, hostile Sunni towns and cities will be impossible to properly control. The locally rooted, more subtle appendages of the regime’s coercive apparatus have been destroyed,89 and the regime will lack sufficient economic largesse to buy goodwill.90 Jihadist radicalism will remain, albeit in a reduced form, and it will poison the refugee diaspora. This may be the direction things are headed in Syria’s west, but the United States is under no obligation to help the regime along. And it seems unlikely the regime will ever muster the strength and will to retake the east from the YPG91 and Islamic State, both competent, determined enemies. Additional superpower air support will not decisively change that. Meanwhile, U.S. normalization with or backing for the Assad regime would legitimate more than five years of appalling brutality, violence by the regime against the Syrian people on a shocking, unforgivable scale. Affirming the regime’s law-of-the-jungle barbarism—chemical weapons, “barrel bombs,” deliberate siege and starvation—would obviate America’s claims to moral leadership and further undermine international law and norms. A United States in league with the Assad regime would be rendered complicit in the regime’s criminal atrocities. America would suffer serious reputational damage, both on the global stage and in the Middle East specifically. A surge in anti-American anger among some constituencies in the Arab Middle East could produce new extremist violence against Americans at home and abroad, further complicate America’s relationships with traditional allies, and impair counterterrorism cooperation at the elite and popular level. By partnering with the regime, the United States would primarily be advancing Iran and Russia’s agendas, not its own. Russia is apparently seeking to reinforce regional order by providing unqualified support for the region’s authoritarian strongmen, including Assad, without recognizing that these strongmen’s excesses are themselves a major contributor to regional instability.92 Still, even while Russian aims in Syria are problematic, it seems possible for the United States to identify at least some points of commonality with Russia. Iran’s goals, meanwhile, are more directly antithetical to U.S. interests. The swarm of auxiliary militias Iran has created in Syria will almost certainly be used by Iran to wield influence more directly and forcefully inside Syria, influence it will use to project power beyond Syria and reinforce its deterrent capabilities against Israel and its Western allies. America should not midwife Iran’s efforts to strengthen its deterrent against America and America’s friends. America should continue to deconflict its operations against Islamic State and Fateh al-Sham with the regime and its Russian ally. Anything more than that would be a mistake. Even if the United States is prepared to de-escalate its support for the Syrian opposition, it should not cut off the opposition abruptly or unilaterally. The United States has spent the last five years investing in and building working relationships with the opposition, from activists to local governance officials to exile politicians to rebel commanders. Totally abandoning them would be immoral. It would also be irresponsible politically. America’s allies are co-vested in the opposition, and any American moves should, to the extent possible, be coordinated with them. If America is going to pursue a larger strategic reorientation, it will need to carefully manage these relationships to avoid a more damaging rupture. Moreover, America’s support for the opposition is an important source of leverage on the Assad regime and its allies. It should be traded and bartered for, not given away for free. As the United States seeks to de-escalate, it should bargain with the regime’s backers—not the regime itself—to secure a maximally soft landing for America’s opposition allies and pro-opposition civilians. There are limits to what can be realistically achieved in negotiations. The negotiated, bilateral de-escalation of Syria’s central civil war is not worth pursuing. The regime is determined to restore its authority over the entirety of Syria, and it will not trade away its sovereignty piecemeal. It will not agree to effectively cede whole provinces, particularly sections of its core western territory such as Idlib. (If the regime does sign onto some deal, it should be expected to subvert or abrogate it.) It is also a waste of time to try to extract credible commitments from the regime to carry out any internal structural reform or protect specific domestic political constituencies. There is also no reason to believe that Russia can promise regime concessions and compliance with any agreement, a central premise of U.S.-Russia Geneva negotiations. If Russia wants to show that it is a serious interlocutor on behalf of the regime, let it deliver some of its original commitments under the original February cessation of hostilities—in particular, large-scale detainee releases. Russia and the regime can muddy the water over humanitarian access to besieged opposition enclaves by claiming that there are insurmountable safety issues; there is no way they can claim rebels are obstructing detainee releases. This is the purest test of Russian leverage on the regime. Absent this demonstration of Russian capabilities, there is little point negotiating with Russia over regime behavior. What is worth pursuing seriously is negotiations with Russia over Russian behavior. There are serious questions about Russian good faith, particularly after its apparent bombing of a relief convoy in September,93 but it is nonetheless worth testing Russia’s willingness not to bomb or support regime offensives against specific, geographically limited zones. But the United States should attempt to extract lasting Russian commitments to the arrangements it has already struck with Jordan (and potentially Israel) on southern Dara’a and al-Quneitra provinces, and with Turkey on the eastern Aleppo countryside (Euphrates Shield). These buffer areas could be either semi-autonomous, with some non-security presence for the Syrian state; or, as in eastern Aleppo, governed by local Syrian opposition institutions and partially integrated into the neighboring state’s (Turkey’s) administrative apparatus. Pro-opposition Syrian IDPs could live in these areas mostly or entirely outside the regime’s reach, relieving some of the refugee burden on these neighboring countries. And these buffers could also address key security concerns for neighboring countries, either by putting distance between Syrian (but really Hizbullah and Iranian) forces and the Israeli border or by blocking the YPG from controlling the majority of Turkey’s southern border. The Assad regime and some of its allies are unlikely to respect these arrangements, but, without Russian air support for the regime, these well-armed border enclaves ought to be able to defend themselves and enforce a stalemate. Turkey and Jordan (and, quietly, Israel) would thus be responsible for managing these pockets of Syrian territory and, directly or through proxies, excluding more dangerous, radical actors. The United States should also engage Russia and Turkey to negotiate permanent substate autonomy for PYD-controlled Rojava under dual U.S.-Russian protection. The YPG has been America’s most important partner in the fight against Islamic State in Syria, and continuing collaboration with the YPG will be critical if the U.S.-led coalition’s gains against Islamic State are to be sustainable. Yet the PYD-YPG is going to face attack by the Assad regime and, more importantly, neighboring Turkey. Turkey may no longer see the United States as a fair broker, but America should nonetheless try to arrange an intermediate settlement between Turkey and the PKK—or TEV-DEM, or whatever acronym is most conducive to PKK cadres sitting opposite the Turks—in the interest of both ensuring Turkey’s stability in its southeast and heading off a destructive confrontation in northeast Syria. Rojava and the Turkish-controlled eastern Aleppo countryside can also be safeguarded by a continued limited presence for allied foreign troops, if only to deter hostile actors from shooting in and inadvertently sparking an international conflict. Outside powers are, by all appearances, entirely comfortable killing Syrians inside Syria. Yet they are much more circumspect about accidentally killing U.S. Special Forces south of the Sajour River, Turkish Armed Forces north of al-Bab, or, on the other side, Russian personnel deployed alongside Syrian regime units throughout Syria’s west.95 These semi-permanent foreign deployments can help ensure the stability of these zones of control. But even the presence of U.S. troops on both sides of the Turkey-YPG line in eastern Aleppo and elsewhere may be insufficient to prevent a showdown between Turkey and America’s Syrian Kurdish allies. America has to balance its campaign against Islamic State with the urgent need to avoid a Turkish-YPG mini-war that would undo America’s gains to date against the jihadist organization. The United States should continue to snap up territory at the edges of Islamic State control, where possible, and to assassinate Islamic State leadership with targeted airstrikes. But it’s also important to acknowledge that, with Islamic State seriously weakened and the Turkish border now sealed, the United States has already met its most important goals in the fight against the group. With no remaining border points with Turkey to transport men and supplies, Islamic State in Syria and Iraq is now mostly contained. Islamic State’s provinces elsewhere in the world will persist, and it will continue to plot and remotely organize foreign terrorism from within its Syrian-Iraqi rump. But it is now dramatically less dangerous than it was in 2014. Local politics do not currently permit the United States to achieve total, lasting victory against Islamic State. America should therefore calibrate its approach to the incremental gains that are currently available. At the same time, it can lay the groundwork for a more complete victory in the medium term. But for now, waging unlimited war for a limited, reversible victory would not be advisable. SDF fighter embraces local woman after capture of Manbij. Source: ypgrogava.org. For now, the United States lacks useful partners on the ground to take major new territory from Islamic State and, afterwards, to build a durable political and security order. Al-Raqqa, specifically, seems out of reach. The YPG, although it has moved to isolate the city, will not move to actually capture al-Raqqa without a major U.S. concession that would effect a total break with Turkey. Turkey’s Euphrates Shield is not a viable alternative. Euphrates Shield likely isn’t capable of taking al-Raqqa, but, in any case, it cannot reach al-Raqqa without opening a major battle with the YPG in Manbij or suffering Russian and regime airstrikes on Turkish armor. The United States should not prioritize the capture of half of a rural Syrian province from Islamic State over its already-damaged alliance relationship with Turkey. The United States has little choice but to fight Islamic State with one hand and, with the other, try to avoid a confrontation that could destabilize Turkey and provide a new opening for Islamic State. The eastern Aleppo countryside in particular is a powder keg, and the United States should actively discourage provocative moves by either Turkey or the YPG. As for al-Raqqa and Deir al-Zour, the United States should continue to train and equip Syrian Arab troops who can fight within the framework of the SDF—that is, under YPG supervision—and can continue to creep southwards. At the same time, it is very possible that an eastern Arab force under Kurdish YPG tutelage will never be sufficiently numerous or effective to capture the rest of Islamic State’s holdings in Syria. There may be little practical choice but to leave Islamic State in al-Raqqa and Deir al-Zour, at least for now. Syria’s war has already deformed Syrian society and the broader Middle East. Many of the war’s destructive effects—in particular, the physical and psychological damage done to the Syrian people—are impossible to fully reverse. But what is done to alleviate and mitigate them will be hugely important both in human terms and for the future stability of the region. The United States must ensure that the basic humanitarian needs of Syrians inside and outside the country are met and that these people are, as much as possible, able to live with autonomy and dignity. This is a human imperative and a burden that the United States, out of some minimum sense of solidarity, ought to bear. But it is also a matter of regional and international security. If young Syrians inside the country can only provide for their families by joining roving militias—either jihadist marauders or half-criminal pro-regime gangs—the country will remain locked in a cycle of predation and anarchic violence. And if refugees abroad are penned up in camps or denied the basic freedoms to move and work, they will become a permanent, resentful underclass vulnerable to recruitment by criminals and radicals. The United States needs to continue its humanitarian relief to all areas of Syria, irrespective of factional control. It should also keep up its support for governance and services inside Syria’s opposition-held areas, both for purely humanitarian reasons and to prevent sudden, out-of-control refugee flows. And the United States should continue its generous assistance to refugees in Syria’s neighbors. Those neighbors, in turn, must be encouraged both to better integrate Syrians into civic life and, as the Assad regime takes more territory inside Syria, to allow in new Syrian refugees who cannot live safely under regime control. Not every Syrian in, for example, Idlib will flee the regime’s advance or go into permanent exile. Some civilians are basically apolitical or are, above everything, attached to their communities and homes. They will either remain in their towns or, if they are driven out by aerial bombing and clashes, return after the front line moves forward. But many others will have justifiable, irresolvable fears for their safety under the regime, or for the safety of a loved one. The United States must push Syria’s neighbors, especially Turkey and Jordan, to let these people in.96 To that end, the United States should use both carrots—financial inducements—and sticks, including the withholding of other assistance and cooperation. If Jordan specifically is too fragile to take in new refugees, the United States should arrange for the entrance of southern Syrian refugees to Jordan and transit on to a third country. And everyone needs to be disabused of the notion that these Syrian refugee populations are somehow a temporary phenomenon, or that most of these refugees can be induced to return to Syria after a stabilizing resolution to the war. Some will undoubtedly go back, but, after a war of this terrifying ferocity and with the real threat of retaliation by the regime, most of these people will remain abroad and form a permanent diaspora. They need to be accommodated in place. As for the continued application of sanctions on Syria and the Assad regime, they are a low-risk means for the United States to exercise some political leverage, although it seems highly unlikely that they will compel any substantive change in regime behavior. With or without sanctions, the United States should not facilitate or invest in a regime-led reconstruction effort that will enrich the regime’s crony allies and fuel its patronage networks. None of these policy recommendations are particularly appealing, and they are unlikely to satisfy the American people’s demand for proactive solutions. Americans can see the carnage left by the regime’s aerial bombing; Syrian refugee families drowning in the Mediterranean; and murderous loners swearing allegiance to Islamic State’s Abu Bakr al-Baghdadi under black flags. It’s normal that they would want the U.S. government to somehow fix things. But American objectives in Syria and in the war against Islamic State, as they have been defined publicly by the Obama Administration, have not been achievable. President-elect Trump seems ready to redefine American aims in Syria, but, in his own way, he risks overpromising or dedicating the United States to goals that can only be realized at an intolerable cost. The recommendations I’ve outlined are an attempt to square President-elect Trump’s stated strategic priorities—about which I personally have reservations—with the realities of the Syrian war and with America’s capabilities as I understand them. In the latter days of the Obama presidency, and ahead of the planned coronation of President Hillary Clinton, the policy and analyst community put forward a number of interventionist Syria plans that were confident, forward-leaning, and mostly unfeasible. Some of their policy recommendations were mostly harmless, including anything premised on a moderate opposition that could assert itself, if only it were given more and better arms. Others—including arguments to call Russia’s bluff because Russia could be trusted to rationally calculate that a counter-escalation wasn’t in its interests97—were, I thought, reckless. Too many advocated escalation against the Assad regime without regard for that approach’s limited and unclear prospects for success, or for the major, untenable risk it would entail. Now America is in danger of going too far in the other direction, by committing to destroying Syria’s jihadists, totally and forever, with no regard for the moral and strategic cost. There are realistic limits to what the United States can achieve in the fight against Islamic State and other jihadist groups in Syria. And the United States has other important strategic equities against which its counterterrorism aims need be balanced. The United States cannot extricate itself totally from Syria. The war has an outsized, material impact on U.S. interests, and the United States is at least positioned to mitigate some of its most destructive second-order effects. But the United States also needs to keep some strategic perspective. Bombing nonessential Assad regime infrastructure and risking a shooting war with Russia was not worth it then. Joining hands with monsters and launching a doomed campaign to perfectly defeat Islamic State is not worth it now. It’s understandable, faced with Syria’s human catastrophe, its strategic complications, and its jihadist threat to the American homeland, that people on both sides of the political aisle would reach for a policy solution that is aspirational. But we’re now beyond pursuing something that looks heroic, or like a victory. At this point, the United States needs to stick to the reasonable and the possible. Monica Langley and Gerard Baker, “Donald Trump, in Exclusive Interview, Tells WSJ He Is Willing to Keep Parts of Obama Health Law,” Wall Street Journal, November 11, 2016, http://www.wsj.com/articles/donald-trump-willing-to-keep-parts-of-health-law-1478895339. “Russia/Syria: Extensive Recent Use of Cluster Munitions,” Human Rights Watch, December 20, 2015, https://www.hrw.org/news/2015/12/20/russia/syria-extensive-recent-use-cluster-munitions. “If the Dead Could Speak: Mass Deaths and Torture in Syria’s Detention Facilities,” Human Rights Watch, December 16, 2015, https://www.hrw.org/report/2015/12/16/if-dead-could-speak/mass-deaths-and-torture-syrias-detention-facilities. Ian Black, “Report on Syria conflict finds 11.5% of population killed or injured,” The Guardian, February 11, 2016, https://www.theguardian.com/world/2016/feb/11/report-on-syria-conflict-finds-115-of-population-killed-or-injured. “2016 Humanitarian Needs Overview: Syrian Arab Republic,” United Nations Office for the Coordination of Humanitarian Affairs, October 2015, https://www.humanitarianresponse.info/en/system/files/documents/files/2016_hno_syrian_arab_republic.pdf. Molly Bangs, “Working Toward Peace in Syria with Education,” The Century Foundation, May 25, 2016, https://tcf.org/content/commentary/working-toward-peace-syria-education/. “Schools under Attack in Syria,” Syria Response (South Turkey) Education Cluster, September 3, 2015, http://www.protectingeducation.org/sites/default/files/documents/final-education-under-attack_sturkey-briefing-paper_2015-09-03.pdf. Sam Heller, “Syria’s Rebels Lose a Symbolic Stronghold,” The Century Foundation, September 1, 2016, https://tcf.org/content/commentary/syrias-rebels-lose-symbolic-stronghold/. Alaa Nassar and Maria Nelson, “After relentless bombardment, two northwest Damascus towns give up and the evacuations begin,” Syria:direct, October 13, 2016, http://syriadirect.org/news/after-relentless-bombardment-two-northwest-damascus-towns-give-up-and-the-evacuations-begin/. These tactics have frequently been described as sectarian or ethnic cleansing, but that is something of an oversimplification. Darayya was evacuated totally, but, given the extensive damage to the city and the small number of holdout residents, it was also an exceptional case. A deal like Qudsiyya’s seems more typical, in which the regime expels committed (Sunni) militants and their families but other (Sunni) residents remain. The sectarian dimension of these tactics is thus somewhat overstated, even as it undoubtedly informs regime thinking and how its strategy is understood by Syria’s people. “New Approach in Southern Syria,” International Crisis Group, September 2, 2015, https://www.crisisgroup.org/middle-east-north-africa/eastern-mediterranean/syria/new-approach-southern-syria. Muhammad Abu Rumman, “Rahanat al-Urdun wal-Tadakhul al-Rousi (Jordan’s Gambles and Russian Intervention),” October 19, 2015, https://www.alaraby.co.uk/opinion/2015/10/18/%D8%B1%D9%87%D8%A7%D9%86%D8%A7%D8%AA-%D8%A7%D9%84%D8%A3%D8%B1%D8%AF%D9%86-%D9%88%D8%A7%D9%84%D8%AA%D8%AF%D8%AE%D9%84-%D8%A7%D9%84%D8%B1%D9%88%D8%B3%D9%8A. “Rigged Cars and Barrel Bombs: Aleppo and the State of the Syrian War,” International Crisis Group, September 9, 2014, https://www.crisisgroup.org/middle-east-north-africa/eastern-mediterranean/syria/rigged-cars-and-barrel-bombs-aleppo-and-state-syrian-war. Sam Heller, “The Syrian Regime Is Close to a Victory That Could Turn the War,” VICE News, February 4, 2016, https://news.vice.com/article/the-syrian-regime-is-close-to-a-victory-that-could-turn-the-war. Aron Lund, “A Turning Point in Aleppo,” Diwan: Middle East Insights from Carnegie, December 1, 2016, http://carnegie-mec.org/diwan/66314. Sam Heller, “Al Qaeda Quits Syria in Name Only,” The Century Foundation, July 29, 2016, https://tcf.org/content/commentary/al-qaeda-quits-syria-name/. Sam Heller, “Are Syria’s Rebels at Al Qaeda’s Mercy?” The Century Foundation, July 26, 2016, https://tcf.org/content/commentary/syrias-rebels-al-qaedas-mercy/. Adam Entous, “Covert CIA Mission to Arm Syrian Rebels Goes Awry,” Wall Street Journal, January 26, 2015, http://www.wsj.com/articles/covert-cia-mission-to-arm-syrian-rebels-goes-awry-1422329582. Thanassis Cambanis, “The Syrian Revolution Against al Qaeda,” Foreign Policy, March 29, 2016, https://foreignpolicy.com/2016/03/29/the-syrian-revolution-against-al-qaeda-jabhat-al-nusra-fsa/. The failed, Ahrar al-Sham-led campaign to exterminate Jund al-Aqsa—a fraction of Fateh al-Sham’s size and strength—is a useful illustration of the impossible difficulty of uprooting jihadists in the north. Jund al-Aqsa was, until recently, a hyper-extreme Nusra Front splinter with a reputation for being the north’s most toxic, dangerous jihadist faction, riddled with Islamic State sympathizers and allegedly responsible for a running campaign of assassinations and bombings against other factions. It was also, like Fateh al-Sham, majority-Syrian, with its members drawn largely from a few Idlib cities and towns. After a year of escalating tensions, Jund al-Aqsa’s detention of an Ahrar al-Sham unit spurred Ahrar al-Sham to rally the north’s non-jihadist factions to finally exterminate Jund al-Aqsa. But when the three-day running battle across Idlib killed some of Ahrar’s most prominent leaders and seemed to be compromising rebel fronts with the regime in neighboring Hama, Fateh al-Sham stepped in. Fateh al-Sham accepted Jund al-Aqsa’s pledge of allegiance and extended its protection to Jund’s membership, thus short-circuiting the campaign. “Security Council Unanimously Adopts Resolution 2139 (2014) to Ease Aid Delivery to Syrians, Provide Relief from ‘Chilling Darkness,’” United Nations, February 22, 2014, http://www.un.org/press/en/2014/sc11292.doc.htm. “Adopting Resolution 2209 (2015), Security Council Condemns Use of Chlorine Gas as Weapon in Syria,” United Nations, March 6, 2015, http://www.un.org/press/en/2015/sc11810.doc.htm. Aron Lund, “The Failure to Stop Starvation Tactics in Syria,” Diwan: Middle East Insights From Carnegie, March 31, 2014, http://carnegie-mec.org/diwan/55172. Thanks to the international relief effort, the only starvation in Syria is now essentially manmade—limited to a handful of besieged pockets, most of them encircled by regime forces, that have been deliberately deprived of food and medicine. Aymenn Jawad Al-Tamimi, “The Desert Falcons: An Elite Pro-Assad Force,” Syria Comment, April 8, 2014, http://www.joshualandis.com/blog/desert-falcons-elite-pro-assad-force/. Aymenn Jawad Al-Tamimi, “Quwat Dir’ Al-Amn Al-Askari: A Latakia Military Intelligence Militia,” Syria Comment, September 3, 2016, http://www.joshualandis.com/blog/quwat-dir-al-amn-al-askari-another-regime-intelligence-militia/. Aymenn Jawad Al-Tamimi, “The Local Defence Forces: Regime Auxiliary Forces in Aleppo,” Syria Comment, May 23, 2016, http://www.joshualandis.com/blog/local-defence-forces-regime-auxiliary-forces-aleppo/. Tobias Schneider, “The Decay of the Syrian Regime Is Much Worse Than You Think,” War on the Rocks, August 31, 2016, http://www.joshualandis.com/blog/local-defence-forces-regime-auxiliary-forces-aleppo/. Aron Lund, “The Political Geography of Syria’s War: An Interview With Fabrice Balanche,” Diwan: Middle East Insights From Carnegie, January 30, 2015, http://carnegie-mec.org/diwan/58875. “2016 Humanitarian Needs Overview: Syrian Arab Republic,” United Nations Office for the Coordination of Humanitarian Affairs. Aron Lund, “Assad’s Other War: Winning on the Ground, Defeated by the Pound?” Diwan: Middle East Insights From Carnegie, April 5, 2016, http://carnegie-mec.org/diwan/63231. Stephanie Nebehay, “Mass deaths in Syrian jails amount to crime of ‘extermination’: U.N.,” Reuters, February 8, 2016, https://www.yahoo.com/news/mass-deaths-syrian-jails-amount-crime-extermination-u-130753471.html?ref=gs. See, for example, the “Five Principles” announced by the Syrian Islamic Council in September 2015 and endorsed by an assortment of other revolutionary bodies and factions. All five principles are negative: rejections of Assad himself, the regime’s coercive apparatus, foreign occupying forces, partition, and a sectarian division of power. Even this document represented only the minimum consensus within the mainstream opposition, not including jihadists. Sam Heller, “Assad Will Talk, But He Won’t Negotiate,” Foreign Policy, November 22, 2016, https://foreignpolicy.com/2016/11/22/assad-will-talk-but-he-wont-negotiate/. “Syria conflict: Exclusive BBC report from inside IS-held Manbij,” BBC, July 21, 2016, http://www.bbc.com/news/world-36848681. Aron Lund, “Why Islamic State Is Losing, and Why It Still Hopes to Win,” The Century Foundation, June 17, 2016, https://tcf.org/content/report/islamic-state-losing-still-hopes-win/. “Steps Toward Stabilising Syria’s Northern Border,” International Crisis Group, April 8, 2016, https://www.crisisgroup.org/middle-east-north-africa/eastern-mediterranean/syria/steps-toward-stabilising-syria-s-northern-border. Ben Hubbard, “New U.S.-Backed Alliance to Counter ISIS in Syria Falters,” New York Times, November 2, 2015, http://www.nytimes.com/2015/11/03/world/middleeast/new-us-backed-alliance-in-syria-exists-in-name-only.html?_r=1. “Department of Defense Press Briefing by Col. Warren via Teleconference in the Pentagon Briefing Room,” U.S. Department of Defense, October 13, 2015, http://www.defense.gov/News/Transcripts/Transcript-View/Article/622954/department-of-defense-press-briefing-by-col-warren-via-teleconference-in-the-pe. Haifa Moussa, “Limadha al-Federaliyyah al-Demoqratiyyah Hiyya al-Hall al-Wahid li-Souriyya? (Why Is Democratic Federalism the Only Solution for Syria? ),” ANHA, March 17, 2016, http://www.hawarnews.com/%D9%84%D9%85%D8%A7%D8%B0%D8%A7-%D8%A7%D9%84%D9%81%D8%AF%D8%B1%D8%A7%D9%84%D9%8A%D8%A9-%D8%A7%D9%84%D8%AF%D9%8A%D9%85%D9%82%D8%B1%D8%A7%D8%B7%D9%8A%D8%A9-%D9%87%D9%8A-%D8%A7%D9%84%D8%AD%D9%84%D9%91/. Ibrahim Hamidi, “‘Souriyya al-Mufidah’ al-Kurdiyyah… wa-Federaliyyah (‘Useful Syria’ Is Kurdish… and Federalized),” Al-Hayat, March 18, 2016, http://www.alhayat.com/Articles/14521771. Muhammad Alloush (@Mohammed_Aloush), Twitter, March 18, 2016, https://twitter.com/Mohammed_Aloush/status/710809284938964992. Carl Drott, “The Syrian Experiment with ‘Apoism,’” Diwan: Middle East Insights From Carnegie, May 20, 2014, http://carnegie-mec.org/diwan/55650. Wladimir van Wilgenburg, “Young female mayor breaks boundaries in Syrian town freed from Islamic State,” Middle East Eye, July 1, 2016, http://www.middleeasteye.net/in-depth/features/young-female-mayor-breaks-boundaries-syrian-town-freed-552711157. Raja Abdulrahim and Dion Nissenbaum, “Kurds Carve Out a Home in Syria, Testing U.S. Ties With Turkey,” Wall Street Journal, August 31, 2016, http://www.wsj.com/articles/syrias-kurds-have-carved-out-a-statelet-adding-new-snags-to-a-complex-region-1472661321. “Jabhat Thuwwar al-Raqqa Tu’lin Hall ‘Jeish al-’Ashair’ (Al-Raqqa Revolutionaries Front Announces Dissolution of ‘Clans Army’),” Al-Dorar al-Shamiyyah, January 4, 2016, http://eldorar.com/node/93291. “‘Aqab Inshiqaqih ‘Anha… Qiyadi Yakshaf: ‘Souriyya al-Demoqratiyyah’ Khadi’ah li-’PKK’ wa-Tas’a lil-Taqsim (After His Defection… Commander Reveals SDF Answers to PKK, Is Working Towards Partition),” Kulluna Shuraka, September 18, 2016, http://www.all4syria.info/Archive/345879. Aron Lund, “Bombers Over Hasakah: Assad Clashes With the Kurds,” Diwan: Middle East Insights From Carnegie, August 22, 2016, http://carnegie-mec.org/diwan/64375. Sam Heller, “US-Backed Rebels Struggle to Fend Off Islamic State Offensive in Northern Syria,” VICE News, May 29, 2016, https://news.vice.com/article/us-backed-rebels-struggle-to-fend-off-the-islamic-state-offensive-in-northern-syria. Adam Entous et al., “Turkish Offensive on Islamic State in Syria Caught U.S. Off Guard,” Wall Street Journal, August 30, 2016, http://www.wsj.com/articles/turkish-offensive-on-islamic-state-in-syria-caught-u-s-off-guard-1472517789. Angus McDowall and Tom Perry, “Syrian rebels seize ‘doomsday’ village where Islamic State promised final battle,” Reuters, October 17, 2016, http://www.reuters.com/article/us-mideast-crisis-syria-dabiq-idUSKBN12G088. If rebels fighting as part of Euphrates Shield somehow managed to re-link eastern Aleppo with greater Idlib, there is every reason to expect that Fateh al-Sham will reach into eastern Aleppo and attempt to liquidate specific FSA factions, in particular several units overtly trained and equipped by the United States that Fateh al-Sham has already identified as targets. Aron Lund, “After Murky Diplomacy, Turkey Intervenes in Syria,” Diwan: Middle East Insights From Carnegie, August 24, 2016, http://carnegie-mec.org/diwan/64398. Roy Gutman, “What really happened to the U.S. train-and-equip program in Syria?” McClatchy DC, December 21, 2015, http://www.mcclatchydc.com/news/nation-world/world/article50919765.html; Michael Weiss, “They’ve Got U.S. Guns. Can They Stop ISIS?” The Daily Beast, June 22, 2016, http://www.thedailybeast.com/articles/2016/06/22/they-ve-got-u-s-guns-can-they-stop-isis.html; Missy Ryan, “Revamped U.S. training program, with new goals, has trained fewer than 100 Syrians so far,” Washington Post, June 27, https://www.washingtonpost.com/news/checkpoint/wp/2016/06/27/pentagons-revamped-training-program-has-trained-fewer-than-100-syrians-officials-say/?utm_term=.1b734b807c79. Maria Abi-Habib and Margaret Coker, “U.S. Compromises Won Turkey’s Backing for Kurdish-Led Offensive,” Wall Street Journal, July 14, 2016, http://www.wsj.com/articles/u-s-compromises-won-turkeys-backing-for-kurdish-led-offensive-1468539313; Gordon Lubold, et al., “U.S. Special Forces to Aid Turkish Troops in Syria,” Wall Street Journal, September 16, 2016, http://www.wsj.com/articles/u-s-sending-special-ops-forces-to-northern-syria-1474030801. “Syria Complex Emergency—Fact Sheet #5,” USAID, September 30, 2016, https://www.usaid.gov/crisis/syria/fy16/fs05. “Syria,” USAID/OTI, updated November 3, 2016, https://www.usaid.gov/political-transition-initiatives/syria. In advance of anticipated U.S. strikes on the Assad regime in September 2013, Syria’s most hardline Islamist and jihadist factions—including not just the Nusra Front, but also Ahrar al-Sham—reportedly went to ground. It was only after the Obama Administration’s decision not to strike Assad that these factions returned to the fore and, along with other Islamist-leaning brigades, sloughed off the leadership of the opposition Coalition and foreign-backed Supreme Military Council. These bodies never really recovered or were replaced by anything properly unifying and authoritative. More extreme strains of Islamist militancy seem to have existed within Syria’s armed opposition from the start, often in ways that were not visible to outsiders. But August-September 2013 seems to have been where the armed opposition took a decisive turn towards Islamist and jihadist dominance and the relationship between the United States and the broader opposition largely soured. See Aryn Baker, “Al-Qaeda’s Proxies Among Syria’s Rebels Scared by Threat of U.S. Strikes,” Time, September 5, 2013, http://world.time.com/2013/09/05/al-qaedas-proxies-among-syrias-rebels-scared-by-threat-of-u-s-strikes/; Liz Sly and Loveday Morris, “Syrian extremists in the opposition fear U.S. strike,” Washington Post, August 29, 2013, https://www.washingtonpost.com/world/middle_east/syrian-extremists-in-the-opposition-fear-us-strike/2013/08/29/7c6537a0-10e7-11e3-a2b3-5e107edf9897_story.html?utm_term=.67492c9d933b; Aron Lund, “Islamist Groups Declare Opposition to National Coalition and US Strategy,” Syria Comment, September 24, 2013, http://www.joshualandis.com/blog/major-rebel-factions-drop-exiles-go-full-islamist/. “Al-Rais al-Assad li-Sahifat ‘Komsomolskaya Pravda’ al-Rousiyyah: Leisa Hunak Tanaqud bein ‘Israel’ wal-’Nusrah’ wa-’Da’ish’—Video (President Assad to Russian Newspaper Komsomolskaya Pravda: There’s No Contradiction Between Israel, Nusra, and Daesh—Video),” SANA, October 14, 2016, http://www.sana.sy/?p=444301. Sam Heller, “The Battle for Aleppo Shows That US Strategy in Syria Is in Tatters,” VICE News, February 16, 2016, https://news.vice.com/article/the-battle-for-aleppo-shows-that-us-strategy-in-syria-is-in-tatters. “Turkey to establish 5,000-square-kilometer terror-free zone in Syria, Erdoğan says,” Daily Sabah, October 18, 2016, http://www.dailysabah.com/war-on-terror/2016/10/18/turkey-to-establish-5000-square-kilometer-terror-free-zone-in-syria-erdogan-says. Sam Heller, “Russia Is in Charge in Syria: How Moscow Took Control of the Battlefield and Negotiating Table,” War on the Rocks, June 28, 2016, http://warontherocks.com/2016/06/russia-is-in-charge-in-syria-how-moscow-took-control-of-the-battlefield-and-negotiating-table/. Karen DeYoung and Liz Sly, “U.S.-Turkey Deal Aims to Create De Facto ‘Safe Zone’ in Northwest Syria,” Washington Post, July 26, 2015, https://www.washingtonpost.com/world/new-us-turkey-plan-amounts-to-a-safe-zone-in-northwest-syria/2015/07/26/0a533345-ff2e-4b40-858a-c1b36541e156_story.html?utm_term=.8d96cec5ba89. Mark Galeotti, “Aleppo Is Paying the Price for Russia’s Imagined Global Threat,” European Council on Foreign Relations, October 10, 2016, http://www.ecfr.eu/article/commentary_aleppo_is_paying_for_russias_imagined_global_threat. Andrew Osborn and Christian Lowe, “Russia Will Countenance an Assad Exit in Syria, But Not Yet,” Reuters, June 30, 2016, http://www.reuters.com/article/us-mideast-crisis-syria-russia-idUSKCN0ZG0LO. Jonathan Landay and Warren Strobel, “U.S. Sees Bearable Costs, Key Goals Met for Russia in Syria So Far,” Reuters, December 28, 2015, http://www.reuters.com/article/us-usa-russia-syria-idUSKBN0UB0BA20151229. Karen DeYoung, “Russian Air Defense Raises Stakes of U.S. Confrontation in Syria,” Washington Post, October 17, 2016, https://www.washingtonpost.com/world/national-security/russian-air-defense-raises-stakes-of-us-confrontation-in-syria/2016/10/17/85c89220-948c-11e6-bb29-bf2701dbe0a3_story.html?utm_term=.159f7fc25e34. “General Konashenkov: Russia Will Take Down Any Unidentified Flying Objects in Syria,” The Saker, October 6, 2016, http://thesaker.is/general-konashenkov-russia-will-take-down-any-unidentified-flying-objects-in-syria/. Sam Heller, “Why Diplomatic Talks to End Syria’s Civil War Will Fail—Again,” World Politics Review, January 19, 2016, http://www.worldpoliticsreview.com/articles/17701/why-diplomatic-talks-to-end-syria-s-civil-war-will-fail-again. Michael Kofman, “The Misadventures of Russia and the United States in Syria: Complete Strategy Implosion Edition,” War on the Rocks, October 11, 2016, http://warontherocks.com/2016/10/the-misadventures-of-russia-and-the-united-states-in-syria-complete-strategy-implosion-edition/. Sam Heller, “Handing Syria to Russia Would Inflame Jihadism Abroad,” World Politics Review, February 12, 2016, http://www.worldpoliticsreview.com/articles/17934/handing-syria-to-russia-would-inflame-jihadism-abroad. “‘You Can Still See Their Blood,’” Human Rights Watch, October 10, 2013, https://www.hrw.org/report/2013/10/10/you-can-still-see-their-blood/executions-indiscriminate-shootings-and-hostage. “Taghridat al-Sheikh al-Muheisini (Ma’rakat al-Anfal) (Sheikh Muheisini’s Tweets on the Battle of al-Anfal),” JustPaste.it, March 24, 2014, https://justpaste.it/marsad26. “Al-Muheisini Yuwaddih Masir Mukhtatifi Qaryat ‘Ishtabraq’ (Muheisini Clarifies Fate of Those Abducted from Ishtabraq Village),” Rozana Radio, May 10, 2015, http://rozana.fm/ar/node/12288. Without the active, ground involvement of the Turkish military, it seems unlikely rebels can realize substantial further gains, and there are apparent limits to how far Russia will countenance Turkish intervention inside Syria. Moreover, it is unclear that Euphrates Shield rebels, even with Turkish military backing, can defeat the more organized and disciplined SDF. That includes the SDF in Manbij, where the presence of embedded U.S. Special Forces would make a Turkish-backed attack on the city a serious and dangerous affront to the United States. Aymenn Jawad al-Tamimi, “Additional Notes on the Druze of Jabal al-Summaq,” Aymenn Jawad al-Tamimi: Blog, October 6, 2015, http://www.aymennjawad.org/2015/10/additional-notes-on-the-druze-of-jabal-al-summaq. Sam Heller, “Al-Qaeda Speaks The Language Of Syrian Sectarianism,” Radio Free Europe/Radio Liberty, June 9, 2016, http://www.rferl.org/a/black-flag-syria-islamic-state-al-qaeda-sectarianism-alawites/27788931.html. On the utility of force in compelling the regime to negotiate seriously, the aftermath of the regime’s 2013 chemical weapons attack is instructive. Faced with impending U.S. airstrikes, the Syrian regime acquiesced to a Russian-brokered deal to remove and dispose of its chemical stockpile. But this should not be read as a successful trial run for America’s ability to coerce the regime into major concessions. The regime agreed to sacrifice one of its capabilities but otherwise made no structural reforms and continued prosecuting its war through other means. This deal was fundamentally unthreatening to the regime’s integrity and to its strategic ends; if it had been genuinely disruptive, the regime likely would not have agreed to it. The agreement also drew the United States and other hostile powers into a disposal regime that discouraged them from threatening military action and ultimately seems to have allowed the regime to secretly retain part of its chemical arsenal, in just one example of how the regime can be expected to subvert and exploit any international agreement. For more on the regime’s residual chemical weapons stockpile, see Colum Lynch and David Kenner, Foreign Policy, August 23, 2016, https://foreignpolicy.com/2016/08/23/u-s-and-europe-say-assad-may-have-kept-some-chemical-weapons/. Detentions would need to be reckoned over a basically unlimited time frame—not just in the immediate aftermath of the campaign, but over the next decade or more of retaliatory harassment, arrests, and torture. “Turkey: Syrians Pushed Back at the Border,” Human Rights Watch, November 23, 2015, https://www.hrw.org/news/2015/11/23/turkey-syrians-pushed-back-border. Suleiman al-Khalidi, “Prominent Egyptian al Qaeda figure killed in Syria: jihadist sources,” Reuters, October 3, 2016, http://af.reuters.com/article/topNews/idAFKCN1231XO. Sam Heller, “Failed Ceasefire Bonds Syrian Rebels and U.S. Government,” The Century Foundation, September 29, 2016, https://tcf.org/content/commentary/failed-ceasefire-bonds-syrian-rebels-u-s-government/. In theory, one could argue that Russian influence on the regime could be leveraged to boost Syria’s formal military, the Syrian Arab Army, at the expense of the parallel network of para-state militias Iran has organized and sponsored. In practice, I am skeptical that Russia would have the finesse and know-how to play with the institutional balance of power inside the regime, and I have no faith in America’s ability to re-engineer the regime’s inner workings by Russian proxy. Louis Nelson, “Obama urges Trump to stand up to Russia,” Politico, November 17, 2016, http://www.politico.com/story/2016/11/obama-russia-231556. Yezid Sayigh, “Clausewitz in Syria,” Al-Hayat, October 14, 2016, http://carnegieendowment.org/2016/10/14/clausewitz-in-syria-pub-64761. Whatever détente they now enjoy, some rift between the regime and the YPG seems inevitable. The regime has made clear that it will not tolerate meaningful local autonomy, much less PYD-style federalism. Assad himself has said that he is only interested in an exclusive partnership with the United States, not in sharing the United States with the YPG—“cooperation between two legal governments, not cooperation between foreign government and any faction within Syria.” If the United States is obliged to choose between partnering with the Assad regime and the YPG, then, obviously, America should choose the YPG. This is not to say that the United States has been a force for liberty and democracy in the Middle East, of course. Still, an expanding foothold in the region for another foreign power that is an unapologetic, unhesitating supporter of authoritarian repression and violence—that, by all indications, isn’t even remotely conflicted about it—seems undesirable. Anne Barnard and Somini Sengupta, “‘From Paradise to Hell’: How an Aid Convoy in Syria Was Blown Apart,” New York Times, September 24, 2016, http://www.nytimes.com/2016/09/25/world/middleeast/from-paradise-to-hell-how-an-aid-convoy-in-syria-was-blown-apart.html?_r=1. If Turkey wants to coordinate with Russia to secure a Turkish protectorate in Idlib, along the lines of what it has done with Euphrates Shield, that is Turkey’s prerogative. Turkey is clearly invested in Ahrar al-Sham as a proxy, and it is difficult to imagine Ahrar al-Sham surviving as a major force without its Idlib-Hama base. Even still, it is unclear how much Turkey would be willing to stake on a cross-border enclave that is half-controlled by al-Qaeda-type jihadists and that, unlike Euphrates Shield, does not block PYD-YPG expansion. This is another reason why greater Idlib will likely lose out: The jihadist presence in Idlib means that allied foreign troops (Turks, primarily) cannot safely deploy alongside friendly Syrian proxies. I would also personally advocate that the United States display some modicum of generosity and itself let in more Syrian refugees, but, given President Trump’s campaign rhetoric, I assume that position is a non-starter. Charles Lister, “A Plan for Winding Down the Syrian War: Surge, Freeze, and Enforce,” War on the Rocks, September 30, 2016, http://warontherocks.com/2016/09/a-plan-for-winding-down-the-syrian-civil-war/.